Bob Friedland, CEO of Friedland Realty Advisors and White Plains resident, one of the more well known names in the regional real estate market, is near completion of a much-needed repair for the wooden Holy Ark or Aron Kodesh at the Jewish Community Center (JCC) of Scarsdale. It was expected to be finished and installed for the high holy days this month. This repair, which Friedland has been tackling in his spare time, is the product of a hobby he began eight years ago. That hobby has grown over the years with the design and creation of six Holy Arks. 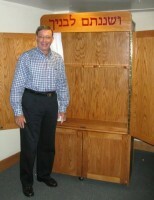 Locally Friedland has produced an Aron Kodesh for Sulam Yaakov in Larchmont and for Temple Israel in White Plains. He has also produced one for a synagogue in Florida and three synagogues in Israel. “It all began eight years ago,” Friedland said, “when I moved into a new home with room to spare.” That room to spare is a three-car garage turned into wood working shop, complete with all the tools and lumber a budding hobbyist could want. Friedland soon learned that working with wood is a great escape from the stresses of the real estate market, but it was his wife Sheila who suggested he take his hobby to the higher level. She knew that Sulam Yaakov needed an Aron Kodesh and suggested Friedland take on the job – which he did and completed with great success. Friedland explains that there are no specific dimensions or prescribed requirements for building a Holy Ark. He does, however, acknowledge that he is very aware he is involved with something holy, creating a transition point between Earth and Heaven – a pathway. The design and wood I choose for each project are made specifically for the particular synagogue or temple it will be housed in, he said. So far Friedland’s designs have included oak and walnut, which he sands to the smoothest of polishes. He jokes that his wife has asked him if he will ever tire of the sanding – but it seems that has become an integral part of the process. The Holy Arks Friedland has designed for use in Israel were commissioned by friends and relatives who live there. One that Friedland is particularly proud of includes wheels so it can be moved. That Aron Kodesh often travels to the Western Wall in Jerusalem where it is used by an organization called Women of the Wall, which tries for women’s equality in Judaism.